Maintaining ideal body weight and managing cholesterol levels is crucial to avoid heart attack. 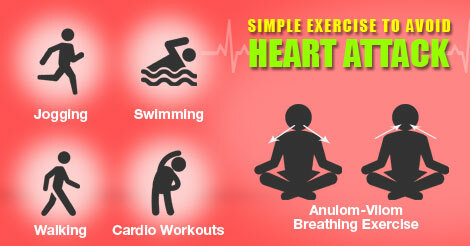 Research suggest that 30 minutes of routine exercise regime can help in avoiding a heart attack. Exercise also reduces stress levels and thus makes your heart healthier and happier. Here we provide you an easy exercise routine to avoid heart attack. A combined research by Harvard and Stanford University suggest that aerobic exercises are equally effective in preventing heart attacks as expensive medications like statins, beta-blockers, diuretics, and anti-platelets drugs. 30 minutes of aerobic exercise like jogging, walking, swimming, and cardio-workouts helps to burn 300, 180, 360, and 370 kcal respectively. One’s goal must be to burn at least 500-600 calories using different forms of exercises. Exercise not only helps to maintain proper body weight but also reduces the risk of heart attack by controlling blood pressure, diabetes, and stress. Yoga exercise are often ignored, but they are indeed real need for today’s world. It is suggested that 15-20 minutes of yoga and pranayama following the aerobic exercise increases the effectiveness of the workout and also relaxes the body. 5 minutes of pranayama and the 5 minutes of Anulom-Vilom breathing exercise are greatly helpful in reducing the blockage in the blood vessels of heart and improves oxygen supply to it. However, the patient with serious heart ailments and history of heart surgery must perform the exercise slowly and must avoid overdoing it. 10 Surya-Namaskar a day are also recommended for those having high cholesterol levels and obesity.